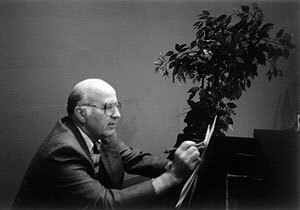 Allyn Laurence Lyon was a composer and arranger of more than two hundred works for choir, strings, piano, and orchestra. He was a professor of music at Western Oregon University in Monmouth, Oregon, for thirty years. He was president of Modern Music Methods, a publisher of string music for children. Lyon was born on February 17, 1934, in Rotterdam, Holland. His father, T. Edgar Lyon was presiding over the Netherlands Mission for The Church of Jesus Christ of Latter-day Saints at the time. After his parents concluded their mission, they returned to Utah where Laurence graduated from high school in Salt Lake City. After serving a mission to Holland, he earned his bachelor’s and master’s degrees from the University of Utah. He served in the U.S. Army for two years, then earned his PhD in music theory at the Eastman School of Music. Two of his hymns, “Each Life That Touches Ours For Good” and “Saints, Behold How Great Jehovah,” are included in the 1985 LDS Hymnbook. “We Are Reverent,” “Christmas Bells,” “An Angel Came to Joseph Smith,” “How Will They Know?” “Little Pioneer Children,” “Whenever I Think about Pioneers,” and “I Have Two Ears,” which appear in the Primary Children's Songbook. BYU-Idaho commissioned the oratorio Visions of Light and Truth. Many of his choral and organ arrangements were performed by the Mormon Tabernacle Choir. While serving on his mission, he organized and directed the choir from that mission that sang at the dedication of the Bern Switzerland Temple. Later he directed choirs that performed at the Portland Oregon Temple and the Seattle Washington Temple. He served in many callings in the Church, including on the Sunday School general board in 1964 and the general music committee from 1985 to 1993. He and his wife, Donna, served a mission to Osorno, Chile, from 1999 to 2000. They also served as ordinance workers in four LDS temples. This page was last edited on 29 April 2016, at 19:48.